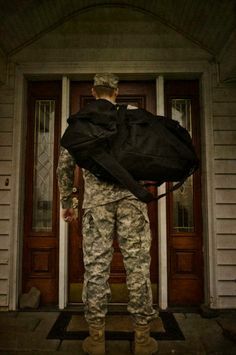 The soldier walked back home. Home… such a distant memory. It has been so long since he last came here. He stepped up to his front door. He stared blankly at it, unable to make a move. Should he knock, or should he enter? Does he still belong here? Is he still welcome? He spent his life with the army. Fighting wars upon wars. Defending the helpless. Attacking the corrupt. The strong always preyed on the weak. He had to be strong for them. No one else could. No one else would. However, the wars never stopped. The corruption spread. Was he making a difference or were all of his efforts pointless? He entered. His family rejoiced; tears in their eyes, smiles on their faces. They embraced him, as a savior, as a revenant. They had changed. Everything had changed. They were old. Wrinkles cracked on their faces. He did not know them anymore. Had he changed also? Was this is real family? He had made his own family in the army. Brothers in arms. He would sacrifice anything for them as some did for him. Their memories would never fade from his spirit. Scars that would never heal. A brotherhood of selflessness and sacrifice. He tried to make a living but he didn’t know how. He had learned so many skills, yet none of them were of any use to him. This society had so many rules and restrictions; things he had forgotten over the years. Rules don’t apply to soldiers. Rules get you killed in war. His friends found love and founded families. He envied them. He did not remember how to fall in love. His friends had it all figured out. The soldier had never felt so alone. A soldier could not love. Love was weakness. A soldier could not be loved as he could not keep promises. He felt constricted by time. Time he had used on a pointless venture. Time he wished he had spent on himself as all others seemed to do. He still could not find a purpose to guide him. Something that would drive him. He was haunted by his past, tormented by his troubles, sadened by loneliness and pressured by his lost time. He quit the army. Hoping to find a new purpose. Hoping… that it was not too late. Still, the soldier searches… for a goal, for something to bring him happiness, to bring him closure. He knows he will find it. All he can do is rise from this point. In his heart of hearts, he knows he willd still amount to greatness. That was very moving. It must be difficult for a soldier to adjust to returning home. So many have mental health problems to add to their worries. Thank you for sharing. The truly story about every soldier, who was a soldier by vocation.